Construction has already begun at 4765 Broadway, which the building's agent says will be home to a new Starbucks location. 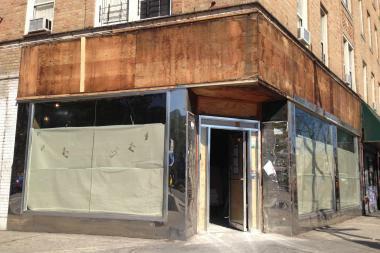 INWOOD — Starbucks' long-rumored venture into Inwood appears to be inching closer to reality, after a building agent said the coffee chain signed a lease at a Dyckman Street storefront. Tom Torres, a real estate agent with New Rochelle-based SW Management, told DNAinfo New York that Starbucks signed a lease to move into a site at 4765 Broadway, right next to the Dyckman Street A train station. Torres wouldn't say the exact date of the lease signed by the coffee chain, which already has locations on 168th and 181st Streets, nor did he reveal the expected opening date. All he would say is that the opening "will be before the end of the year." Work has already begun at the address, which was formerly home to a clothing store. Rumors of a Starbucks' arrival in the neighborhood have been floating since April, when a Community Board 12 member said that company was looking set up shop somewhere near 207th Street and Broadway. Starbucks reps would not confirm the rumor at the time, saying only that the company was always looking for new locations. Starbucks representatives did not respond to requests for comments .